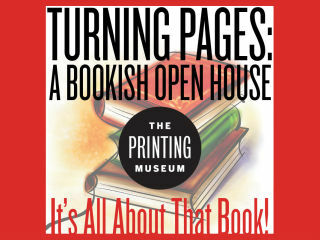 The Printing Museum is hosting its second open house, Turning Pages. The local community is invited to come and help celebrate books and the ways TPM keeps the craft and art of books alive. At Turning Pages, visitors can explore the art of the book during mini-workshops on traditional hand paper making, paste paper, stone lithography printing, letterpress printing and book binding. Throughout the day, staff, friends and board members will share their favorite books, including hosting public readings of their favorite children’s books. Visitors will also have a chance to win wonderful book-related prizes through drawings and special children’s activities. Sponsors and friends of the Museum will serve or display their product, information, artwork and crafts throughout the day. Children can find exciting clues and facts about the Museum through a scavenger hunt. Mr. Sizzles Curbside food truck will be parked in front of the Museum for guests to purchase their stuffed burgers, loaded fries and more.